There’s a Charis Bible College near you – and now is your chance to experience it first-hand! Charis Day 2019 is a free, special event set up for those who want the in-person fellowship that Charis Bible College offers but can’t make it to our main campus in Woodland Park, Colorado. This is a multicampus event that will give you the opportunity to explore the Charis experience, all on a Saturday morning. Visit a Charis campus near you on July 27, 2019 and hear Andrew Wommack speak in a live stream from the main campus. You’ll listen to excellent Spirit-inspired messages without going far away from home, family, or work. You’ll also be able to meet and talk with the directors of your local campus as well as get your questions answered during a special Q&A session with Andrew and other Charis Woodland Park staff. If you’ve been looking for something more in your life, this could be the new beginning you desire. With over sixty locations worldwide, there’s a good chance there’s a Charis campus near you. There’s no place like home to spend time in God’s Word and find out how Charis can help you on the road to God’s calling. Every journey begins with a single step. 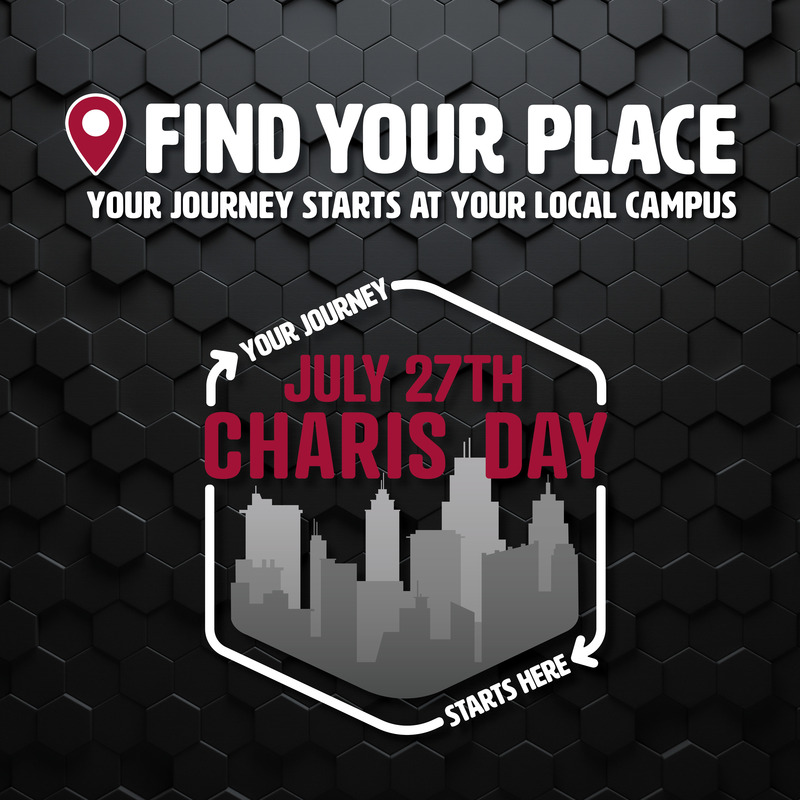 Go to charisbiblecollege.org/campus-locations to find a Charis campus near you and register today! This is not applicable to the Woodland Park campus as it will not be open to guests; this is a livestream program for the locations outside of Colorado only. This event will not be hosted at the Woodland Park campus. WHAT IS CHARIS DAY 2019? Charis Day is a multi-location event where people all over the world will discover opportunities to attend Charis Bible College in their local areas. WHEN IS CHARIS DAY 2019? Charis Day 2019 will be held on Saturday, July 27. We hope to see you there! Charis Day 2019 starts at 10 a.m. Mountain Time on Saturday, July 27. Doors will open thirty minutes before start time. Come early to register and receive your FREE welcome gift! You can join us at your local campus. This is a free event! Bring your family and friends along for the experience. Event viewing will only be available at your local Charis campus. You can find the list of schools attending Charis Day 2019 on the registration page. Click here to register. You can register here. See you there! WHEN IS THE DEADLINE TO REGISTER FOR THE FALL SEMESTER? Deadlines to register for the fall semester vary by campus location. You can find more information about our campus options at http://www.charisbiblecollege.org. WHERE CAN I REGISTER FOR THE FALL SEMESTER? You can receive more information about applying to a campus of your choice at http://www.charisbiblecollege.org. Charis Day 2019: At a Charis location near you! © 2019 Charis Bible College. All rights reserved.